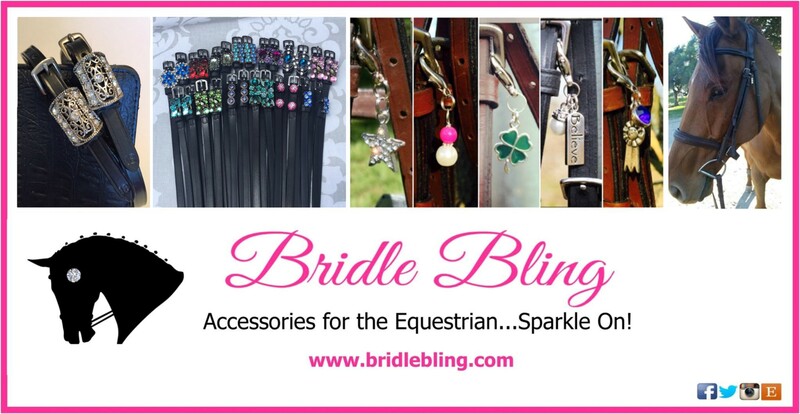 Personalized items are huge right now in fashion and in the equestrian world. 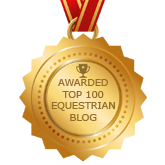 They offer a chance to be unique and set yourself apart at the barn as well as making it easier to distinguish what stuff belongs to whom. 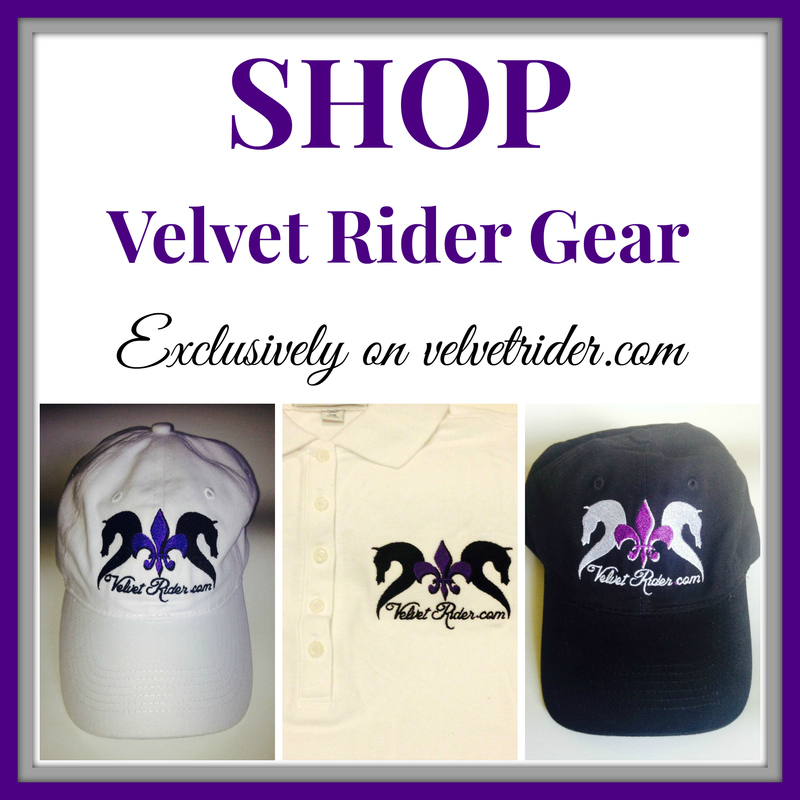 You can also choose items that have a barn or equestrian team theme. 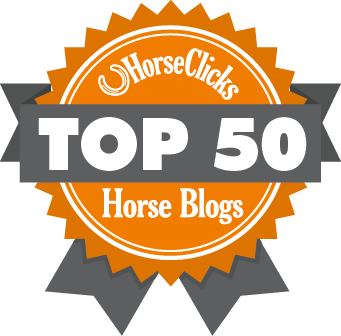 Comfortably Stabled is here to help with just that! They offer custom painted grooming totes, stall signs, brushes, whip holders, and more. Ashley is happy to work with you to get the perfect design to fit your needs, and you won’t be disappointed. 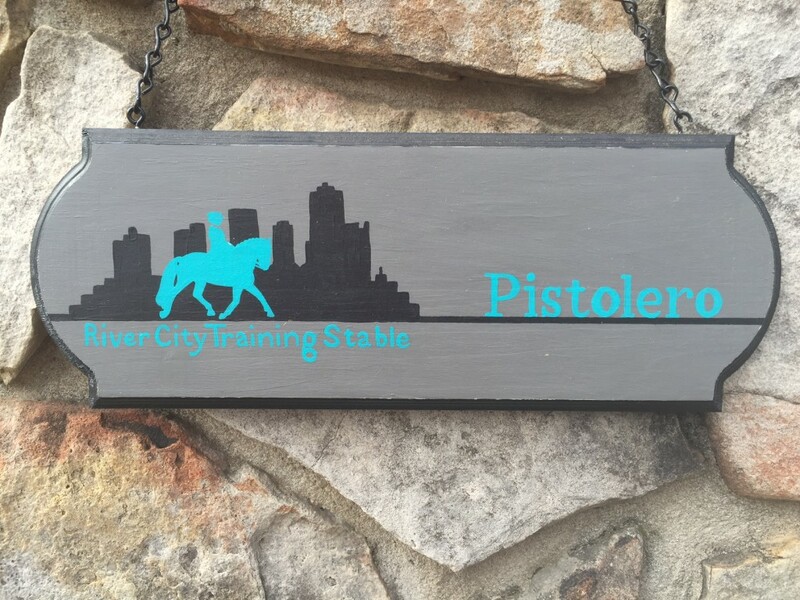 First up is our team stall sign. 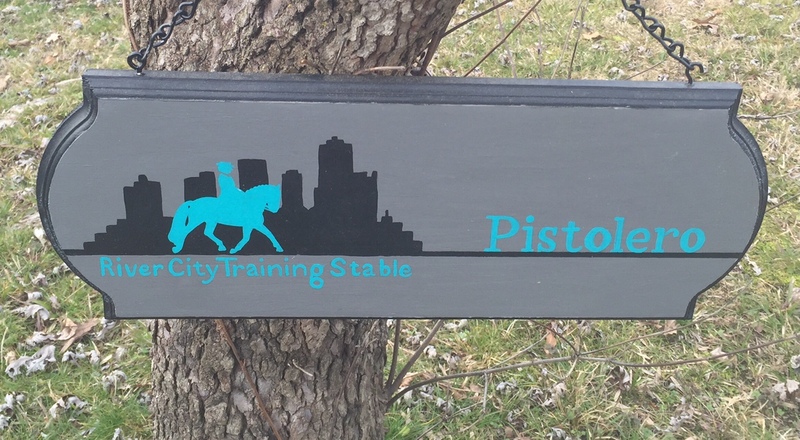 Petey and I competed in our first show together this past November so I was thrilled to get a team stall sign to take with us. 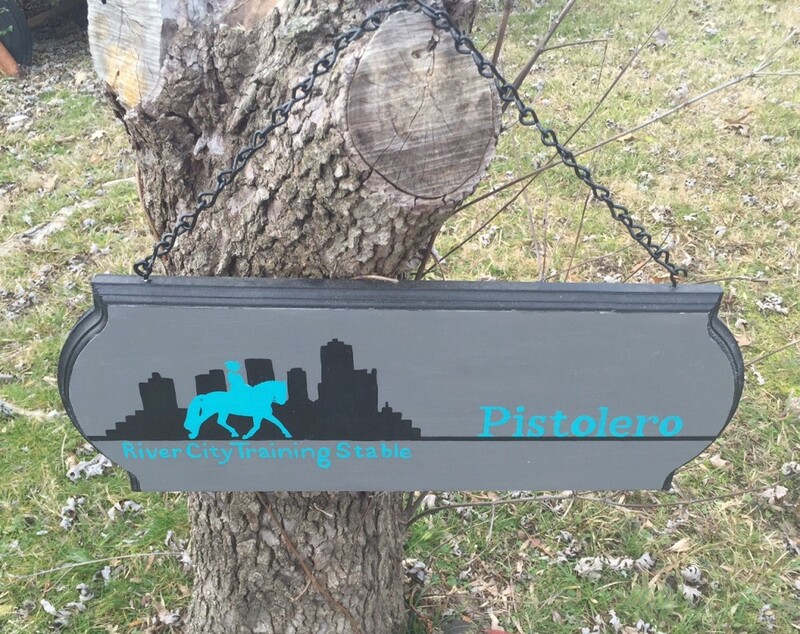 You can always tell what barn row we’re on because we all have matching stall signs. 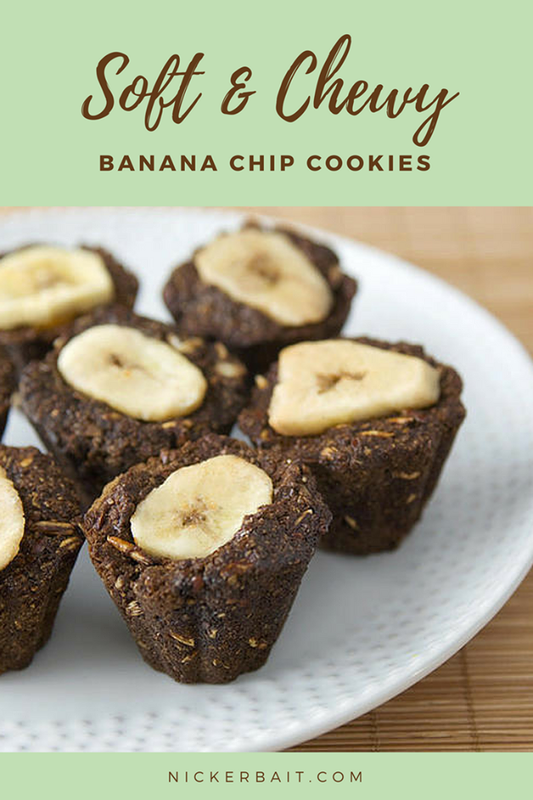 I think this is an awesome idea! Show off your barn or equestrian team with customized stall signs from Comfortably Stabled. 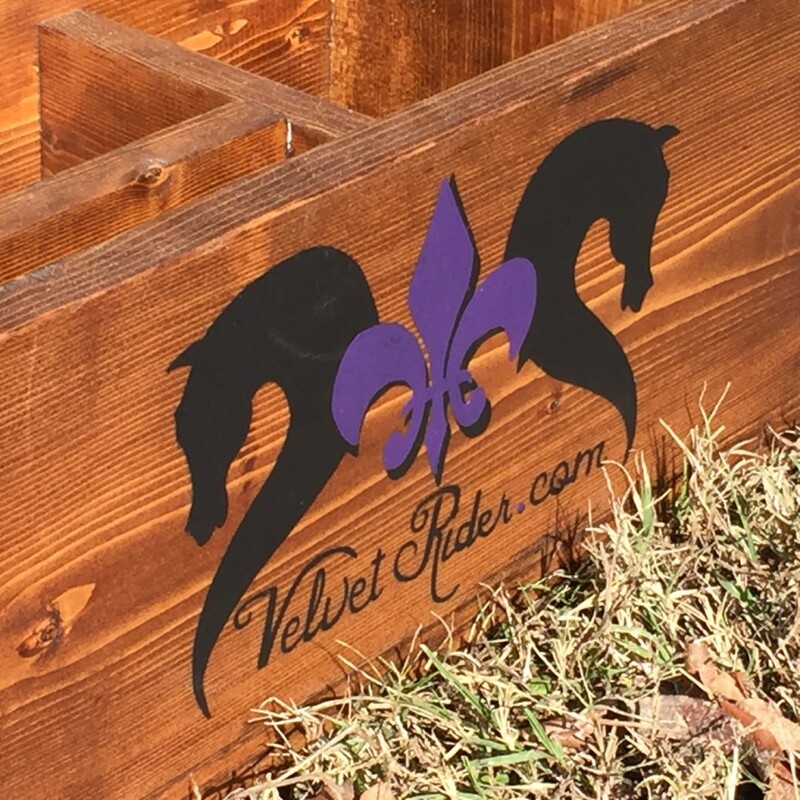 Each sign is custom painted with your choice of colors, design/logo, and wording. I had the option of including my horse’s barn name as well but I decided to just have his show name. I think it turned out beautifully! 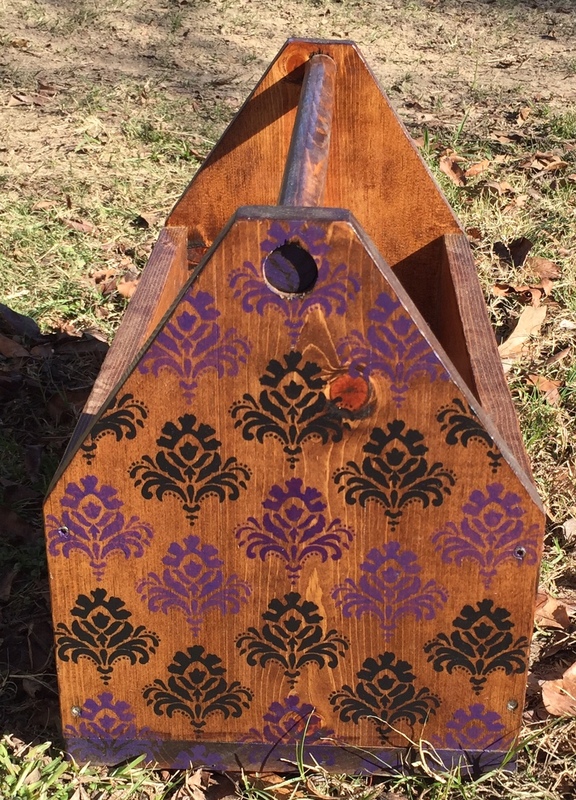 It is custom painted wood and has two hooks with a black chain for hanging. 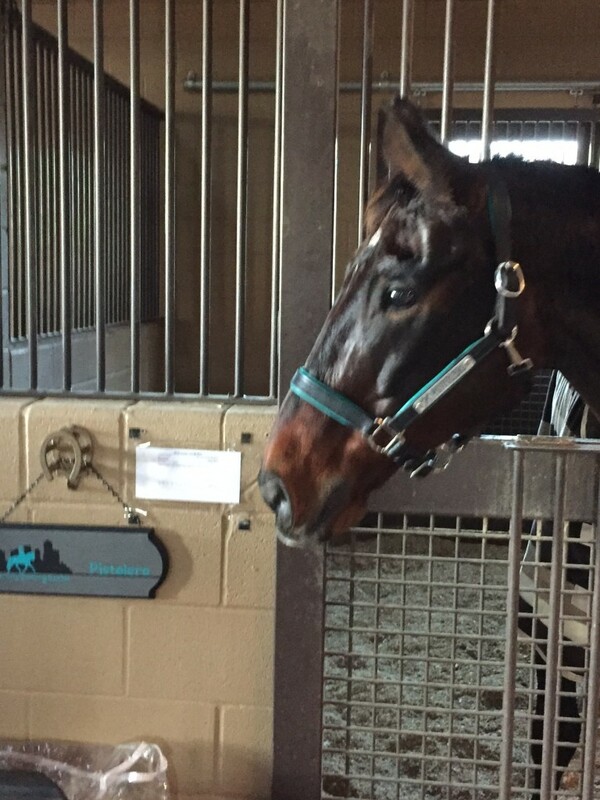 One hook is open so you are able to wrap the chain around stall bars or anything you need to. I love it! It worked perfectly at our show also. 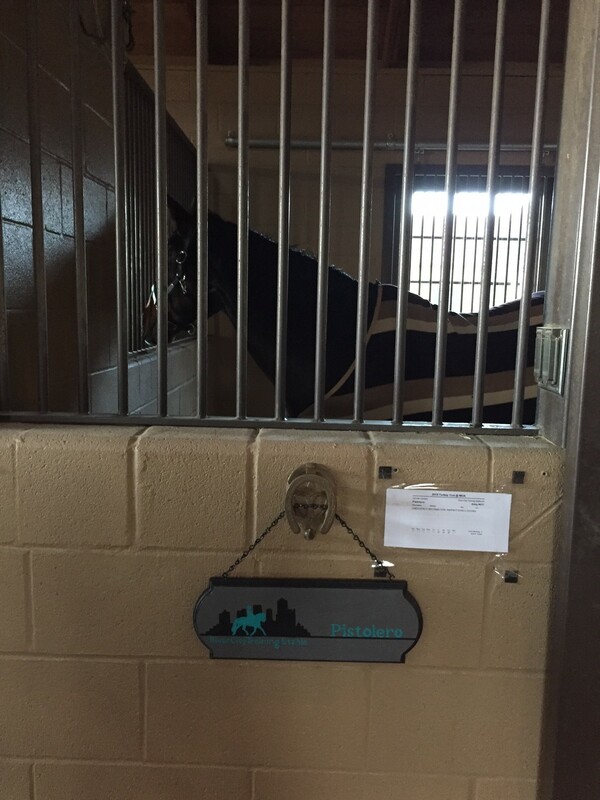 I hung it on the halter/bridle hook outside of the stall. Petey liked it too! 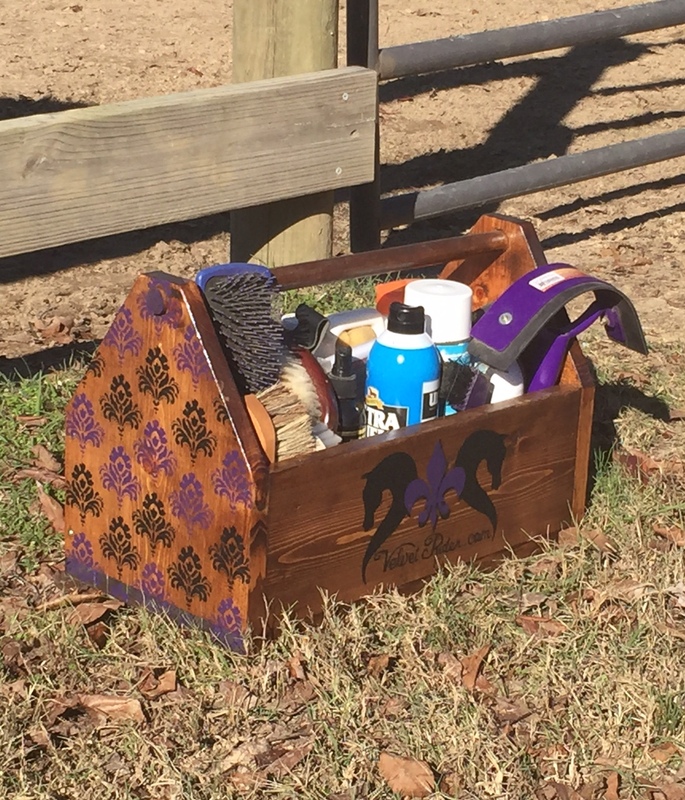 I have always wanted a custom painted grooming tote so Comfortably Stabled did one for me. We did a Velvet Rider theme with my logo and colors (black and purple). Ashley was so easy to work with while deciding all of the details and getting my tote perfect. 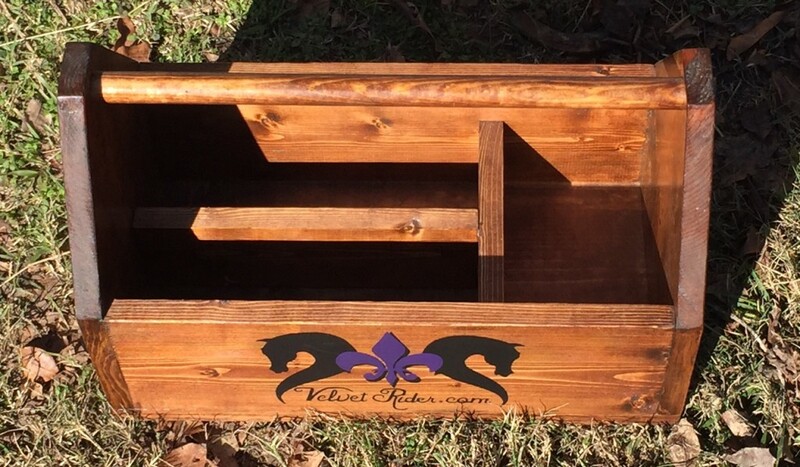 I love stained wood so I was able to choose my perfect stain from a variety of choices. It can be hard to choose one but that’s a good problem to have! So many pretty stains! With Ashley’s help, I picked the perfect stain color for me. I knew I wanted my logo in the center of the long pieces, and after looking through several patterns, we agreed upon a damask pattern in alternating colors for the end pieces. This grooming tote is perfect! 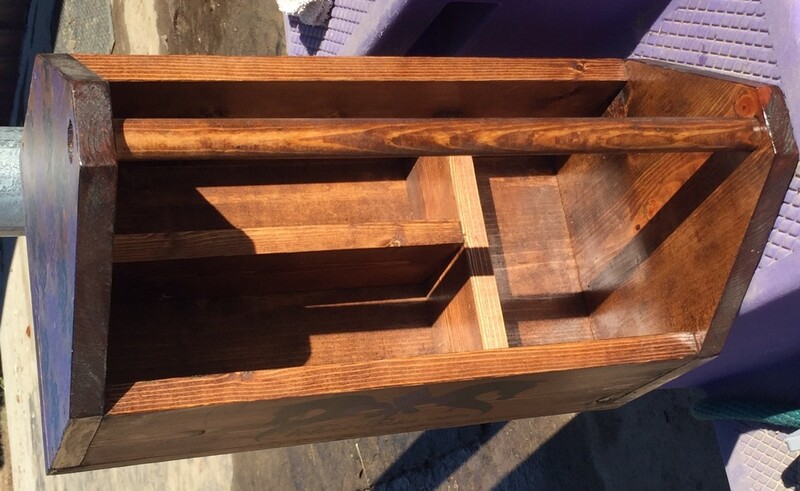 Now, let’s talk about the size and compartments. 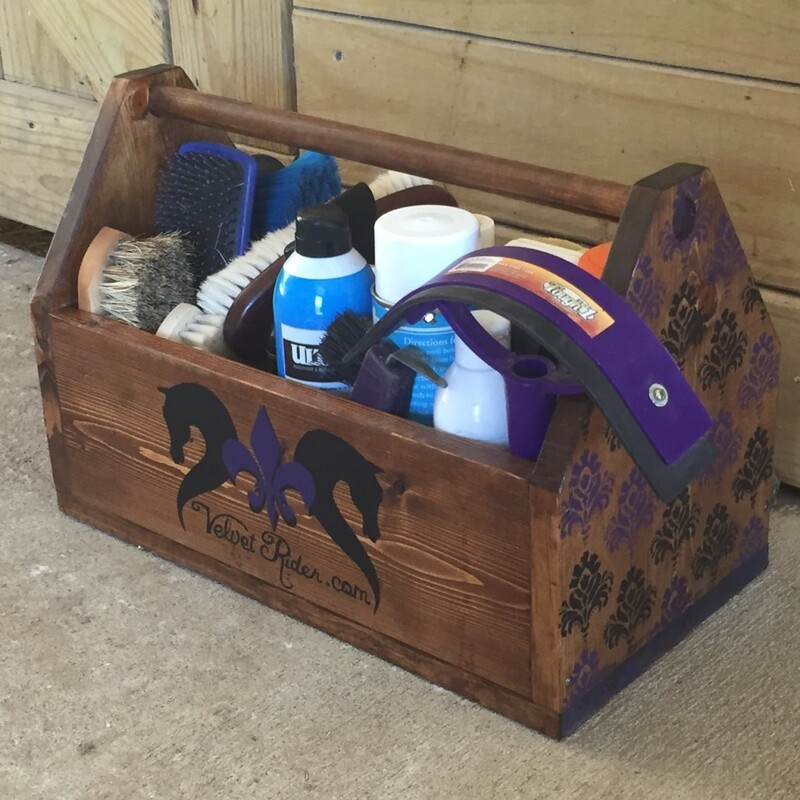 This grooming tote holds so many things! 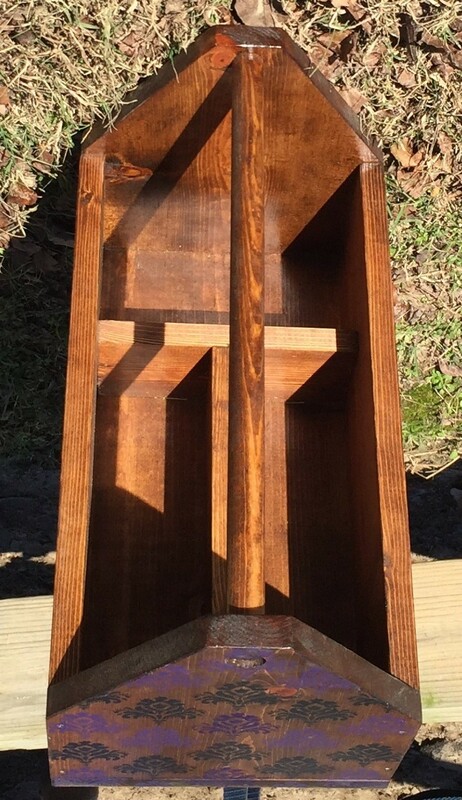 It comes with 3 sections – 2 long and 1 at the end. 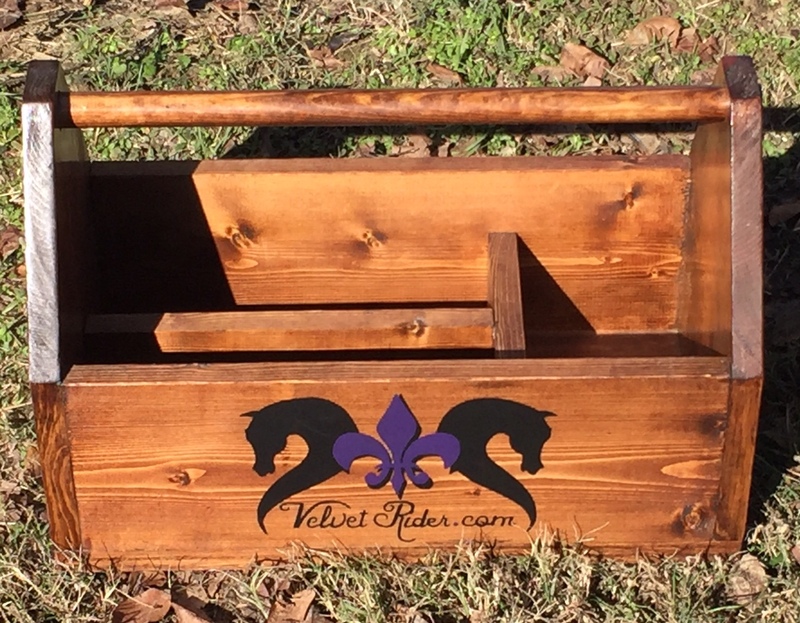 Whatever you need in your grooming tote this one will hold it. I packed it full of my essentials and it worked great. 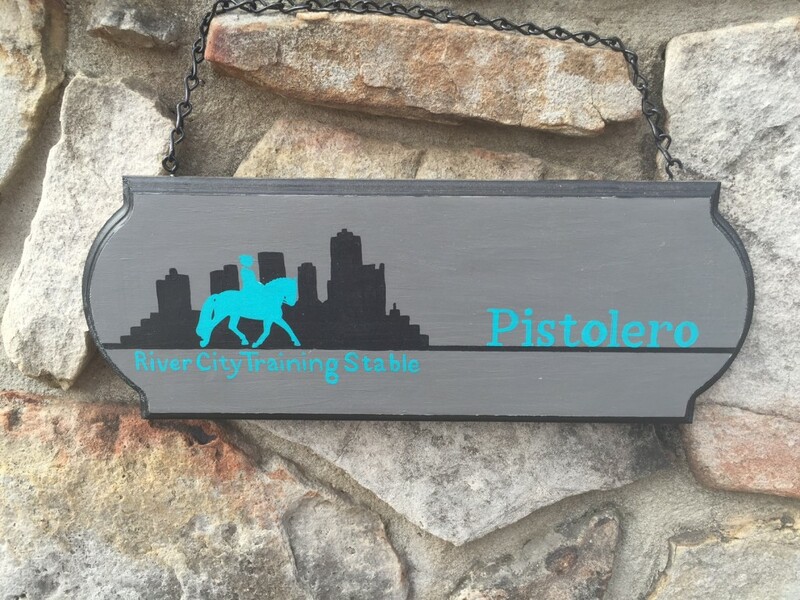 It’s sturdy and easy to carry around, and I get compliments on it all the time. I could not be happier with how it turned out! 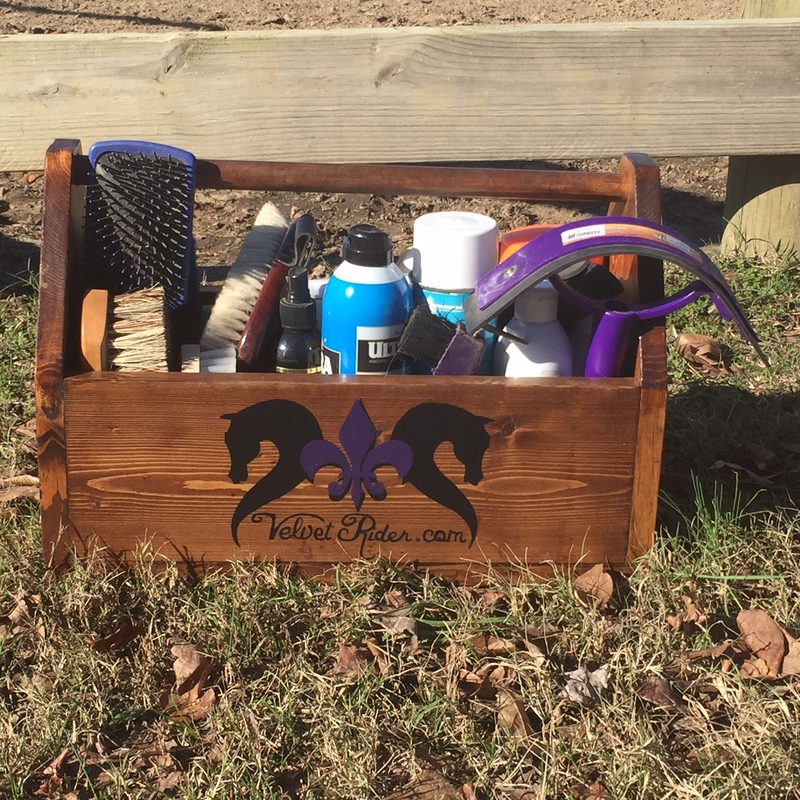 As you can see, I have mine packed full from grooming brushes to fly spray to bath items to leather wipes. I easily had room for everything I felt like I needed. I absolutely love it and could not be more thrilled with how it turned out. 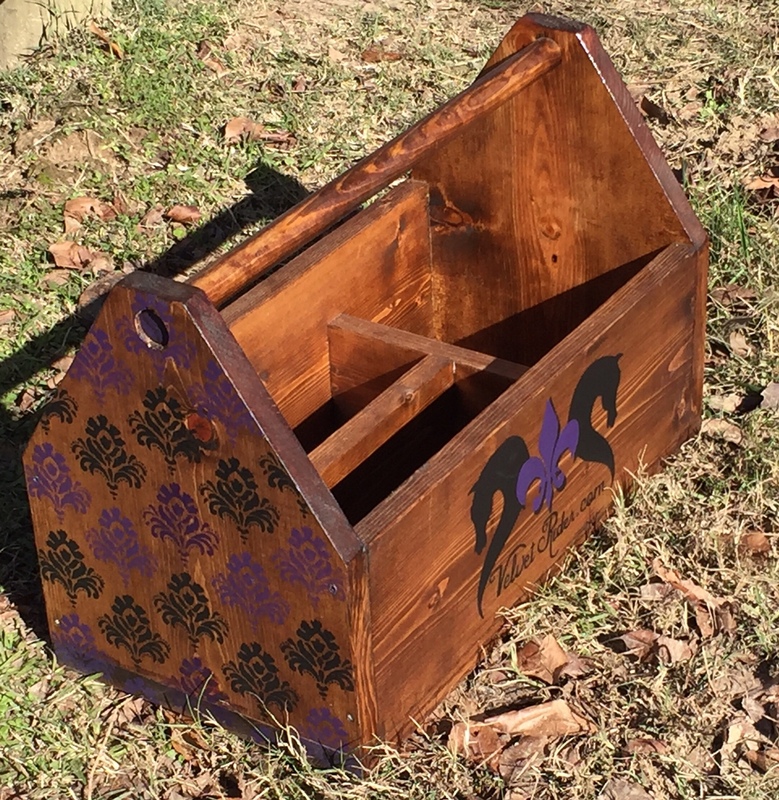 Contact Comfortably Stabled today for your fabulous custom painted barn items! You will love it too! Hello! 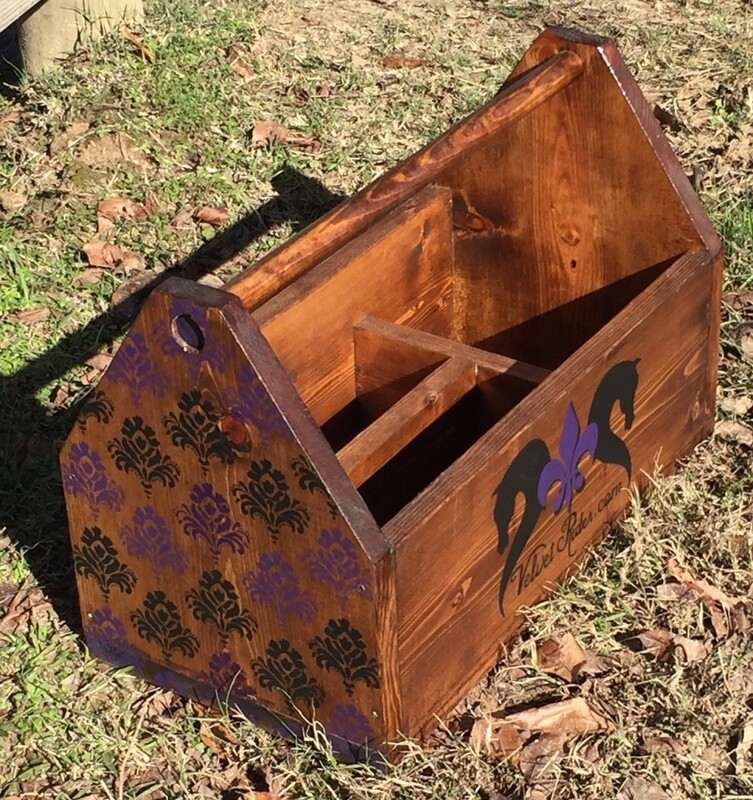 Yes you can get the box without painting – just a wood stain if you prefer. I have fit my bottle of fly spray in it so I would say yes! The girl who does the totes could get you exact dimensions so you could double check against your bottle. Contact is [email protected].